Yesterday I was out shopping with my sister and on the way home, we stopped at Ferrarro's Meat Market. I was hoping to pick up sandwich steaks for tonight's dinner. What I got instead was Osso Buco. Wow! What a fantastic dinner! I found an easy recipe on the Cooking with Nonna site. So good! 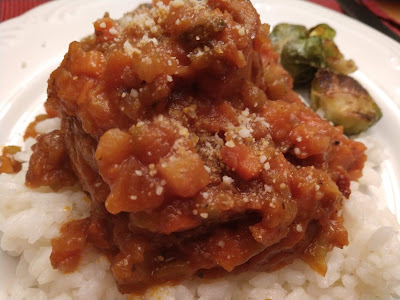 Classic Osso Buco from Rossella’s Cooking with Nonna. Dredge shanks lightly with flour and fry in olive oil until browned on both sides, place in a roasting pan. Saute all veggies in the same pan until slightly soft approx 8 minutes. Pour veggies over veal shanks in roasting pan and add the bay leaves. Cover and place in oven for approx. 1 hour. Remove cover and roast for 25 minutes. The osso buco should be fork tender with a thick sauce and tender veggies. 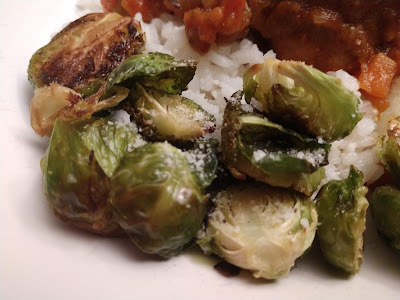 I made Roasted Brussel Spouts and Aborio Rice as sides. Perfect dinner! For breakfast, I made Brown Sugar Apple and Cinnamon Chip Scones. Loved these!! I have been looking for Cinnamon Chips at every local store I go into. I can never find them. Until I checked Amazon. Yup. Found them! I was going to make just Cinnamon Chip Scones but then I noticed the apples on the counter. What happened next resulted in the best scones I have ever made. Combine the flour, baking powder, and soda, salt, and sugar. Cut in the butter until the mixture resembles coarse meal. Stir in the cinnamon chips. Stir in diced apple. Combine the egg yolk, the vanilla, and the buttermilk; stir this into the dry ingredients until just combined. Turn the dough out onto a lightly flowered surface and knead for 6-10 turns. Divide the dough in half and pat each half into a 6-7 inch circle. Cut each circle into 8 wedges. Brush each circle with lightly beaten egg white, dust it with sugar and transfer the wedges to an ungreased baking sheet. Bake at 375 degrees for 18-22 minutes, until golden brown. Cool on a wire rack; after 5 minutes, cover loosely with a dish towel until completely cool.